You’ve just picked up your new Samsung Galaxy Watch, and you’re excited about the potential the smartwatch brings to your wrist. But while you can pick up on some neat features by experimenting on your own, it can take you quite a long time to uncover all the different tricks your Galaxy Watch is capable of performing. That’s where we come in. Instead of spending time sifting through different menus looking for a way to reduce the screen brightness, connect your Bluetooth headphones or whatever else, we’ve detailed 14 tips and tricks to help you out. Read on below to get a better grasp of your Samsung Galaxy Watch. Think we’ve missed a top trick? Let us know in the comments. The ‘My Day’ watch face that debuted on the Samsung Galaxy Watch is great if you want to have a look at your upcoming events, but there’s scores of other options out there for you to choose from. To check them out, touch and hold the screen and swipe through the default options. From here, you can customise the widgets on board, the colours of the face and select its order in the stream. Of course, you’re not limited by the default faces, either. 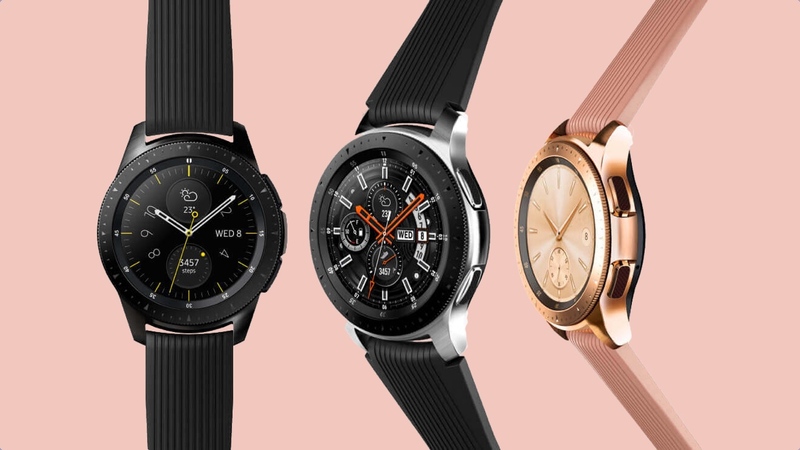 If you want to download some fresh looks, you have two options: either download directly onto the watch from the Galaxy Apps store and head to ‘Top Watch Faces’, or do it through your smartphone on the companion app and sync them over. By default, the Galaxy Watch screen doesn’t stay on all the time, only activating when you touch the screen or raise your wrist. However, unlike the Apple Watch, the Galaxy Watch is able to stay on around the clock. To do this, head down to Display in the Settings section and twist your way down to Watch always on. From here, you can toggle it on/off. You’ve got Spotify support and the ability to store music on the watch itself, but you can only take advantage of this if you have a pair of Bluetooth headphones at the ready. Once your smart earbuds are in pairing mode, all you need to do is travel to Settings > Connections > Bluetooth > BT headset. Once you do, you’ll get the screen above, where the Watch is scanning for nearby devices. Just make sure you’re not in Airplane Mode, and Bluetooth is actually turned on. You know the screen you get when you swipe down from the home screen? Well, it doesn’t have to be filled with the eight default options that come with the Watch. We doubt you’ll want to tinker too much here, considering the options are ones you’ll want to jump to frequently, but if you’re not interested in, say, pressing Airplane Mode, switch it out and get a shortcut to your Bluetooth scanning page, instead. To edit this box, go to Settings > Advanced > Edit quick settings. From here, you can toggle a couple of different options in, such as Goodnight mode and NFC. The app screen couldn’t be easier to roll around, thanks to the bezel of the Galaxy Watch. But you’ll still want to tweak the circled menu to your taste. To do this, simply touch and hold screen until the middle text says ‘Edit mode’. Once it does, all you need to do is drag the icons to your desired position and then hit the top button to set it in place. Alternatively, you can head to Settings > Apps and tweak the order to be your custom mix or instead decided by your most recently used first. If you don’t want to get your grubby mitts on the Galaxy Watch’s screen, this is a great way to avoid touching it when opening apps. In Settings > Apps, you’re able to toggle an option to automatically open your apps. If you select it, the white dot which denotes which apps you’re hovering over will flash for a couple of seconds before opening it without your input. Granted, this can get annoying if you stick on an icon as you try to work out where you want to go, but a solid option to have nonetheless. Handily, the Galaxy Watch is waterproof and able to handle your trips into the swimming pool or your morning shower. However, unless you turn on water lock mode, you may have plenty of false interactions with the smartwatch. Head to Settings > Advanced until you’re able to hit the screen above and toggle Water lock mode on. Once you do, the device won’t wake up through its touchscreen, and the always-on screen is disabled. In this section of settings, you can also eject any water caught in the speaker by twisting the bezel, per the watch’s instructions. Neat. Samsung has ramped up the battery life through this generation – particularly in the 46mm variant – but there’ll still be times when you want to conserve some juice. To do this, you’ll need to once again jump into the Settings menus, heading down to Battery from there. Once you’ve passed through, you’ll see the Default tab selected, as well as the estimate for how long the watch will survive in that current mode. Power saving mode should give you an extra couple of days, while going Watch-only should ramp that up again by roughly tenfold. This one’s fairly self-explanatory, but very handy for when you want to kill your smartwatch screen at the cinema, or really any no-light situation. If you head to Settings > Advanced and go to the Theatre mode tab, you’ll be able to turn it on/off. If you have it toggled on, your watch will remain silent and the screen will stay off. Of course, the always-on screen and wake-up features will turn off and all alerts, alarms and system sounds will be muted. Working in a similar manner to Theatre mode, Goodnight mode instead acts while you sleep. If turned on, the Watch will be able to prevent disturbances when it recognises you’re asleep. This means it will mute all your alerts, except for alarms, and other system sounds that may otherwise wake you up. It also, naturally, turns off the always-on screen and wake-up gesture – because, after all, what’s more annoying than tossing in bed only for your face to be lit up by the watch screen. You’ll know if Goodnight mode is on if the moon icon shows at the top of the watch face screen. We’ve yet to experience any major bugs with the Galaxy Watch, but that doesn’t guarantee there won’t be any for you. If the smartwatch is acting up and you need to give the old off-then-on trick a whirl, simply reboot things by holding onto the power button for roughly seven seconds. Sometimes, a simple reboot won’t be enough to sort your Galaxy Watch out. Or, alternatively, you may just want to start over from from the factory settings. This, of course, will result in you losing all your data on the Watch, but you can fully reset the device by heading to Settings > Advanced > Reset. You can also do this from your phone app and heading to settings. Now, there’s not too many instances when you’ll be wanting to screenshot something on your wrist. However, with that said, if you do find yourself wanting to capture a moment of action, just hold down the power button and swipe right at the same time. It can be a little tricky to get the hang of, but you’ll see the image fly off the top of the screen if you’ve completed it right. And for when you want to catch up on all those wrist-based memories, just head to the Gallery to see what you’ve stored. Just head to Settings > Advanced and enable screen capture to make sure it’s all ready to work. For those icy winter months when you’re wearing gloves but still want to interact with your watch, you can toggle the screen sensitivity for the Galaxy Watch. Simply head to Settings > Advanced > and turn Touch sensitivity on to make the screen a lot more responsive. Be aware that things can get a touch sensitive when you’re glove-less, but it can easily be toggled through the quick settings menu. Thanks for your visiting on this page Get the most out of your new smartwatch, We hope this post can be a good reference for you and provide useful information for you :-). The Pixelbook 2 was a no-show: can Google hold the Chromebook throne?